Discussion in 'General Sports' started by Infield Infidel, Jan 4, 2018. Hope Serena comes back strong. I love watching her play. Ugh, Serena withdrew from the Australian Open. Oh well. Lots of other American women to root for. Murray undergo's hip surgery. Out until at least Wimbledon but doesn't want to rush things and is going to play a reduced schedule focusing on the grand slams. A Vogue cover-story on Serena Williams has been making the rounds among moms, not just tennis fans. Her harrowing story of blood clots and embolisms as complications from giving birth are very scary (speaking as husband to a pregnant mom who's older than Serena...). On the one hand I know what she means, but on the other hand, I wonder if part of that was her edge. Being so defined by victory, where it was the only thing she could control in a turbulent life and that she needed it desperately, has probably been a big factor in her ability to will herself back into matches and dominate them. Her ability to switch from "sloppy and unfocused" and snap into "as focused as Tom Brady and ready to CUT YOU" has always been a calling card of her success and a part of what makes her such fascinating watching. I hope she keeps that. She may need more time to come back physically, but the mental side of it may also take some time to come back - if it ever does. Americans are getting crushed in day 1: Venus (5), Isner (16), Sloane Stephens (13) and CoCo Vandeweghe (10) are all already out, and Jack Sock (8) is getting stomped currently, down 1-6, 1-4 (two breaks). US women are 0-8 today, yoiks. Hurry back, Serena! No one else watching yet? Halep is getting all she can handle against a 17 year old Australian girl of Samoan descent, the youngest player in the draw. Halep also turned her ankle, but she seems to have the match under control now. Wozniacki lost her first set(against someone named Jana Fett) but has bounced back and is up 4-1 in the second. Wozniacki was down 5 - 1 and two match points in the third, but has reeled off five straight games and is now serving for the match. And Tsonga did pretty much the same thing at the same time, coming back from 5-2 down in the 5th by winning five straight against the very talented 18 year old Shapovalov. Stayed up for the Wozniacki and Tsonga matches and boy was it worth it. I generally root for underdogs but was thrilled to see those two pull it out. I'd love to see Caroline win her first major -- minus Halep on the other side, this draw is about as wide open as she could ever hope for. Halep's got a rough half, too. Bouchard in R2, potentially Vesnina in R16, Konta/Pliskova in QF, Sharapova/Muguruza in SF. With Venus out, the biggest challengers in Woz's half are Ostapenko (QF) and Svitolina (SF), against whom she is 0-4 and 1-3 respectively. Unclear whether Sharapova is back to playing at a Top-20 level, or all the way back to a top-5 level. If she survives her 8th of the draw - against #14 Sevastova, #21 Kerber, and then probably #3 Muguruza - we'll know a lot more about where she's at post-suspension. Brutal conditions today, lots of upsets so far, the biggest #3 Muguruza. Djokovic and Monfils on now, Monfils is up a set early but is struggling with the conditions, 130 F on court they said before. If any of you Fed fans are waking up now, he is still on on ESPN2, up two sets and serving down 5-6 in the 3rd. And a few minutes later it's over, an easy hold and a 7-4 tiebreak. Up next, Gasquet in the third round. Halep is on the brink against young American Lauren Davis, four straight breaks for both players at 4-4 in the 3rd and now Davis has held to go up 7-6. Gotta love the cameras on the middle of the net there. Feels almost voyeurish with those outfits. Davis has had a Williamsesque match against Halep - tons of winners, tons of UEs. Davis clearly intends to go down swinging - and now has break point down 7-8* to level it. Halep has served for this match three times and been broken three times, 8-8 in the 3rd now. What a hold by Lauren Davis. Just went for broke a dozen times that game, and got most of them. She's clearly exhausted - some of the missed first serves looked to me to be insufficient leg push - but she is lining them up on groundstrokes. Davis is cramping, I think, and from where Halep is putting it, I think she's reading Davis as having trouble going to her left. "my toenail fell off" -- seems legit. Also this match is like ten percent better because Martina Navratilova is calling it still on the Tennis Channel. I rooted against her almost every match of her career, but she is a fantastic announcer, way better than anyone ESPN uses, men or women. Pliskova is the only other top ten player left in this quadrant, so she is loving this. OK, that point was amazing, at 11-11 and deuce, just trading haymakers. Five break points saved at 11-11 by Davis, and then two more great points to finally hold, up 12-11. WOW. I can't believe the level of mental focus Davis is showing. Her legs are almost gone, her toenail is literally gone, but she's making the right shot every time and her wrist strength is incredible. She really has a perfect skillset to go up against Halep, so many people simply don't have the shotmaking or the power to expose subpar parts of Halep's game, like how often she hits short returns. And yet Halep holds pretty easily again, 12-12. Martina, you are always right, but you have been saying Davis is running out of gas for maybe 16 games now. ...and as I type that Davis gets a net roller on a point she had to do an emergency pop-up for, and holds. The match turned in the few points before Davis lost that toenail. Had 0*-40, 3 match points, pissed them away including a very makeable down-the-line, and Halep just put the screws to her after that. I didn't see the first two sets of that, but the third set kept getting better, some championship level hitting from both in the last bunch of games. Exciting slate left for a day this early, Berdych/Del Potro, Federer/Gasquet, Kerber/Sharapova, Chung/Zverev (20 and 21 years old) and Djokovic/Ramos-Vinolas. 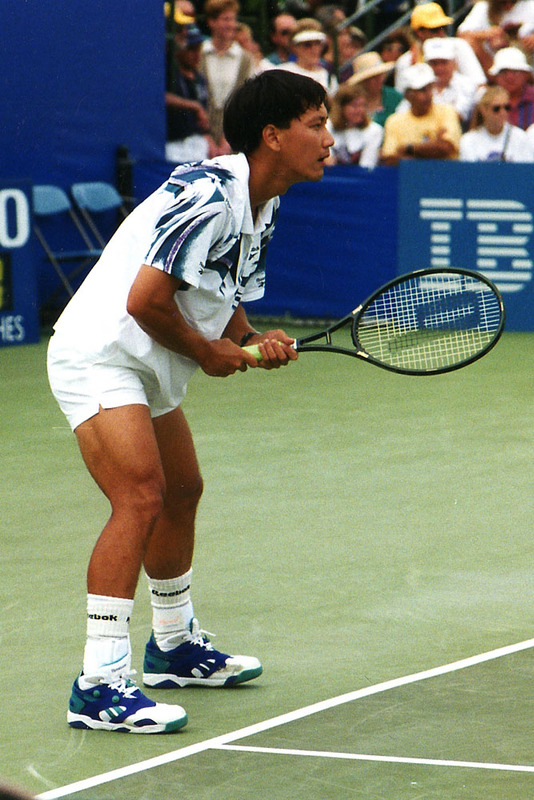 Patrick McEnroe just said Chung has the biggest quads on tour, I hope we get to see a lot of this. Chung might be the geekiest looking top tennis player I've ever seen, but he just kicked the crap out of #4 Zverev in the 5th, skunking him at 6-0. He is probably the best Korean player ever already, not that there has been much competition. But how were his quads? Edit: Large, quite large. Looks like a hockey player’s legs. Chung's win over Zverev helps out Djoker. Big one today for Kyrgios against Dimitrov. Let's see if his good win over Tsonga will take him even further. Went back and watched highlights of Chung vs Sasha Zverev. Chung has got some serious personality. Gave a Jordan-hitting-every-3 shrug at the very end when he bageled Zverev in the 5th, had some styling at other points. I don't really get a huge geek vibe from him. Closer to what you'd get if Kyrgios weren't a d-bag, but with a more demure hairstyle. The thick prescription glasses, the Lacoste shirt that looks like the ones I wore when I was in junior high 35 years ago, the above pic looks normal but last night he looked like someone I'd be surprised to see playing singles on a high school team, let alone playing at a world-class level. It's not a criticism, just an observation, I was rooting for him. Also maybe you only watched the end, but Chung didn't do any yelling for most of the match, I think he started doing it in response to Zverev who was yelling after almost every point late in the match. No yelling, you're right, I'm just saying the dude looked smooth and confident. If his general style plays as well in Korea as Nishikori has in Japan, he's going to be a big star. Dude beat both Zverev brothers in the same tournament, too. Rare feat. Djokovic has looked like the terminator this week, though, so the party likely stops here. But his ranking is probably going to go way up from its current #58. If Wozniacki doesn't make the final with her remaining draw I mean wow will she ever get there again? Unseeded Carla Suarez Navarro in the QF, with either 4th Seeded Svitolina in the SF or a qualifier & 2 unseeded players. This couldn't be set up more perfectly for her. #24 Schwartzman holding his own with Nadal so far, a set all and 1-1 in the 3rd. Nadal closes that out fairly easily, now we get Dimitrov/Krygios. Definitely not discounting Svitolina who is really the only block to the final. One thing against her is she has never been past the QF but that is expected to change this year against a qualifier. Last night went especially late, what I saw of Kyrgios/Dimitrov was impressive, Dimitrov won three tiebreak sets to win in four. Then Svitolina started around 8 AM, but I needed to sleep some more so missed most of that, but I see she won very easily. Kerber over Svitolina (rooting for Madison Keys) and Fed over Nadal (rooting for whoever wins Chung/Djokovic) are my picks from here. Madison Keys takes the first set from #8 Garcia pretty easily 6-3, she hasn't lost a set yet in this tournament.